Tim Tebow: Should he feel insulted that people are attributing his success to God? On Reussee and Mackey on 1500 ESPN radio today there was some things said about Tim Tebow that bothered me. I think it was Mackey that said that Tebow should regard it as an insult that his wins have been attributed to God. Apparently, they were saying that by depending on God’s help that would somehow make him weaker, less capable. I disagree. I don’t think any person who trusts in God and depends on His help is any less capable or any less anything. In fact, a believer in God has a moral strength and a courage that non-believers don’t have. It takes courage to stand up in front of a non-believing world and say I trust in God. I give him credit for doing whats right. It’s always right to attribute God for our success. Because he is our maker. Every good thing we do is from him. 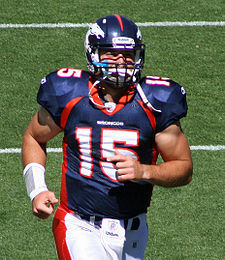 It was also suggested that Tebow has a power of the mind, a power of positive thinking, a self-confidence. And that’s what makes him win. Well, it may be true that he has confidence, but he receives it from God—and I think he is well aware of it. Go Tim Tebo! Keep trusting in God and He will continue to give you everything it takes to win! This entry was posted in Sports, Understanding the Times and tagged Christain character. Bookmark the permalink. 2 Responses to Tim Tebow: Should he feel insulted that people are attributing his success to God? Thats true, but I can’t think of why He would not want you to win. But who am I to say.